The Winning Poker Network has released a schedule of super-satellites feeding into its WSOP Mega-Satellite on July 2nd, with qualifiers starting at $8.80. A couple of weeks ago, we reported on how sites on the Winning Poker Network (WPN) are running a special “WSOP Steps Promotion” through which players can win a $12,500 package to the World Series of Poker Main Event. 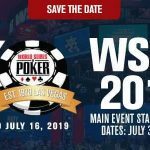 In that article, we mentioned that sites such as Americas Cardroom and Black Chip Poker will be hosting a WSOP Mega-Satellite on July 2nd with fifty $12,500 packages guaranteed. Further information has now been released about the WSOP Mega-Satellite, and the schedule of sub-satellites and super-satellites that will enable players to qualify cheaply for the Mega-Satellite and maximize their ROI. There have also been two further WSOP-themed promotions announced – both of which have already seen their first winners. The Winning Poker Network´s WSOP Mega-Satellite is scheduled for Sunday July 2nd at 3:00pm (ET) and can be bought into directly for $540.00. Like most of the network´s feature tournaments, there is a prolonged late registration period of twenty levels (five hours), by the end of which the 10,000 chip starting stack will represent ten Big Blinds. Although the Mega-Satellite guarantees a minimum of fifty packages to the WSOP Main Event, there will likely be more in the prize pool once late registration has closed. The Mega-Satellite is the biggest qualifying event for the WSOP Main Event since before Black Friday and is the best chance players based in the USA have for winning a seat in the world´s premier live poker tournament. The prize itself will be credited in the form of cash to each qualifying player´s account. It consists of $10,000 for the Main Event buy-in and $2,500 towards travel and accommodation expenses. The Winning Poker Network has said it will process withdrawal requests by Bitcoin within 24 hours. Other cashout methods may take a little longer. Tuesday June 27th @ 8:45pm (all times ET) – $33.00 buy-in turbo satellite guaranteeing a minimum of ten Mega-Satellite seats. Wednesday June 29th @ 8:45pm – $33.00 buy-in turbo satellite with a further ten Mega-Satellite seats guaranteed. Thursday June 29th @ 8:45pm – $33.00 buy-in turbo satellite guaranteeing ten more Mega-Satellite seats. Friday June 30th @ 7:30pm – $66.00 buy-in super-satellite guaranteeing a minimum of fifteen Mega-Satellite seats. Saturday July 1st @ 7:30pm – $66.00 buy-in super-satellite with a minimum of thirty Mega-Satellite seats guaranteed. Sunday July 2nd @ 10:30am – $88.00 buy-in “last chance” super-satellite with sixty Mega-Satellite seats guaranteed. The three super-satellites on Friday, Saturday and Sunday each have their own sub-satellites qualifiers. These are played weekly and have a buy-in of $8.80 (Fridays and Saturdays) and $11.00 (Sundays). Each of the super-satellites will also have a sub-satellite supporting it the evening before. So, for example, you could play in an $11.00 sub-satellite on Saturday July 1st and qualify for the $88.00 buy-in super-satellite on Sunday morning, prior to playing in the Mega-Satellite later that afternoon. 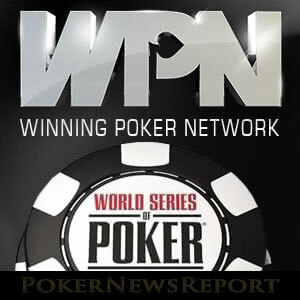 The Winning Poker Network also released two further WSOP-themed promotions last week – a WSOP “Buck Hunt” and the World Series of Jackpots WSOP Edition. The Buck Hunt promotion consists of a flying chip that crosses cash game tables at certain times of the day. The fastest player to click on the flying chip wins a cash prize from $0.01 to $1,000 or a WSOP Package. One lucky player has already won the top prize, and there are plenty more on offer before this promotion closes on 30th June. The World Series of Jackpots WSOP Edition is a version of the Network´s popular three-handed, hyper-turbo Jackpot games. As in all Jackpot games, a random prize is drawn once three players are seated at the table. However, if the WSOP package prize is drawn, all three players win $12,500. There are two buy-ins for the World Series of Jackpots WSOP Edition – $3.30 and $33.00 – and it was in one of the $33.00 games last week that “Danny356”, “NHtoCali” and “0Byte” each won their summer trip to Vegas. If you feel like a summer trip to Vegas, but you do not have the bankroll to support your dreams of winning the WSOP Main Event, visit a site on the Winning Poker Network today. Both Americas Cardroom and Black Chip Poker offer 100% match bonuses on your first deposit up to $1,000, plus a host of promotions from which players can seriously enhance their bankrolls.